Crawl space humidity has been plaguing homes in New York since they were first built. As the space becomes increasingly humid, moisture will condensate on the surfaces in your crawl space, leading to serious problems in your home. We offer free crawl space repair quotes in Poughkeepsie and many areas nearby. To schedule your free appointment, call or e-mail us today! Fortunately, controlling crawl space humidity is easy! At Expediant Environmental Solutions, LLC, a crew of our crawl space contractors can usually install a moisture control system in less than a day. At Expediant Environmental Solutions, LLC, crawl space repair is our specialty, and we'd like to show you why we're the best. To help you decide which repairs are best for you, we offer free crawl space repair quotes to homeowners in our area. 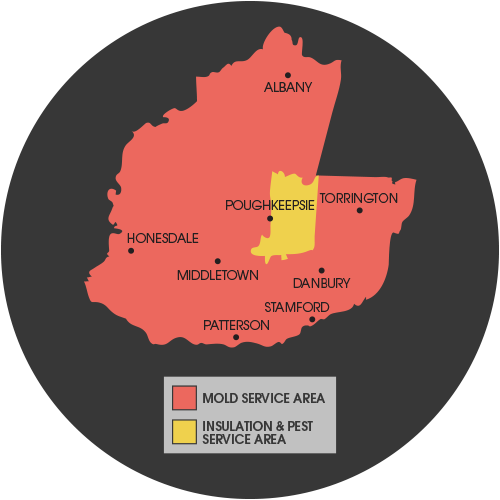 We serve New York, including Millbrook, Wappingers Falls and many areas nearby. To schedule your free quote, contact us today!